Sollah has released TAG® - a unique and comprehensive cloud-based content library with over 5,300 ready-to-use training assets. TAG® users can put our content to work today by choosing from nearly 90 training topics. And to keep our resources in step with our changing world, our menu is ever-growing — with new assets added each week. Powerful training content. Realistic videos. Real results. TAG® makes it easy! With over 5,300 training videos and resources. Create engaging training within minutes from anywhere in the world... at any time. Distributed training has never been easier! Most organizations are on an ever-changing path filled with opportunity and challenges — hurdles that can be overcome with effective training. ​But where to start?... as you look at navigating the ocean of issues and options available? The simple answer is TAG® - or Training Assets Gateway. The power of TAG® is in the benefits it delivers to your organization. Chief among them are reduced training deployment time and a greater return on your training dollars. That all sounds good, right? Here’s how TAG® delivers. Browse the library, then easily drag and drop to select and save a menu of training resources and then add or adjust to fit your preferences. In the process, you’re quickly and easily building a customized training program that fits your organization’s unique set of needs. According to the Association for Talent Development’s 2016 State of the Industry report, the average organization spent $1,252 per employee on direct learning in 2015. In TAG®, select from nearly 90 training topics (and over 6,300 training components) — ​harassment prevention and leadership to personal protective equipment. Choose from facilitation-ready programs, video clips, microlearning, case studies, activities, games, tip cards... ​and more! Build completely new training or update older stuff. The TAG difference adds up quickly. In fact, a company of 500 employees using TAG® can engage and train employees five times for just under $1.99 per employee per training session. High quality training content at a lower investment threshold. Sign up for a FREE 30-day TAG® preview today. Call Sollah at 800-300-8880 or visit http://www.trainingassetsgateway.com. Founded by Bob Chonka and Jon Grannis in 2011, Sollah Interactive produces engaging, memorable training content that maximizes employee knowledge transfer and retention. 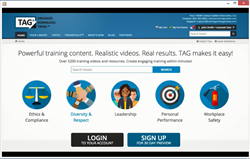 Sollah launched its training platform TAG® (http://www.trainingassetsgateway.com), to facilitate rapid training development by empowering trainers to build new training or blend downloadable components into their existing training.